Research with chickens could one day lead to advanced materials such as self-organizing colloids, or optics that can transmit light with the efficiency of a crystal and the flexibility of a liquid. The unusual arrangement of cells in a chicken’s eye constitutes the first known biological occurrence of a potentially new state of matter known as “disordered hyperuniformity,” say researchers. Research in the past decade has shown that disordered hyperuniform materials have unique properties when it comes to transmitting and controlling light waves, the researchers report in the journal Physical Review E.
States of disordered hyperuniformity behave like crystal and liquid states of matter, exhibiting order over large distances and disorder over small distances. Like crystals, these states greatly suppress variations in the density of particles—as in the individual granules of a substance—across large spatial distances so that the arrangement is highly uniform. At the same time, disordered hyperuniform systems are similar to liquids in that they have the same physical properties in all directions. Combined, these characteristics mean that hyperuniform optical circuits, light detectors, and other materials could be controlled to be sensitive or impervious to certain light wavelengths, the researchers report. 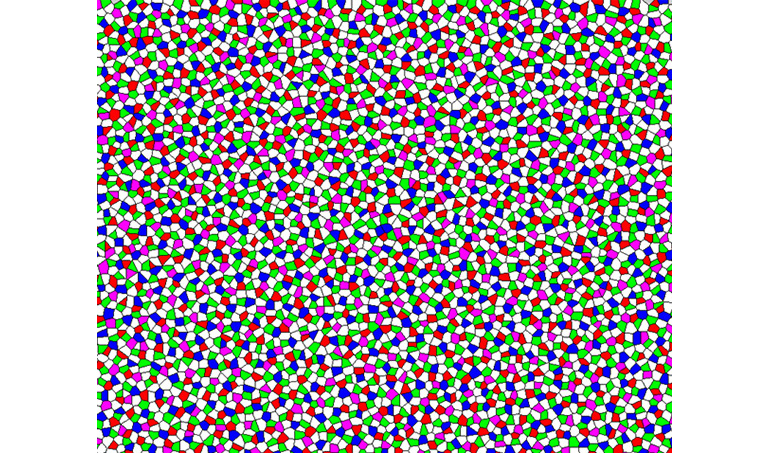 “Disordered hyperuniform materials possess a hidden order,” explains co-corresponding author Salvatore Torquato, a professor of chemistry at Princeton University. It was Torquato who, with Frank Stillinger, a senior scientist in Princeton’s chemistry department, first identified hyperuniformity in a 2003 paper in Physical Review E.
The researchers studied the light-sensitive cells known as cones that are in the eyes of chickens and most other birds active in daytime. These birds have four types of cones for color—violet, blue, green, and red—and one type for detecting light levels, and each cone type is a different size. The cones are packed into a single epithelial, or tissue, layer called the retina. Yet, they are not arranged in the usual way, the researchers report. In many creatures’ eyes, visual cells are evenly distributed in an obvious pattern such as the familiar hexagonal compact eyes of insects. Often the different types of cones are laid out so that they are not near cones of the same type. At first glance, however, the chicken eye appears to have a scattershot of cones distributed in no particular order. Torquato then worked with the paper’s first author Yang Jiao, who received his PhD in mechanical and aerospace engineering from Princeton in 2010 and is now an assistant professor of materials science and engineering at Arizona State University. Torquato and Jiao developed a computer-simulation model that went beyond standard packing algorithms to mimic the final arrangement of chicken cones and allowed them to see the underlying method to the madness. It turned out that each type of cone has an area around it called an “exclusion region” that other cones cannot enter. Cones of the same type shut out each other more than they do unlike cones, and this variant exclusion causes distinctive cone patterns. Each type of cone’s pattern overlays the pattern of another cone so that the formations are intertwined in an organized but disordered way—a kind of uniform disarray. So, while it appeared that the cones were irregularly placed, their distribution was actually uniform over large distances. That’s disordered hyperuniformity, Torquato says. The researchers’ findings add a new dimension called multi-hyperuniformity. This means that the elements that make up the arrangement are themselves hyperuniform. While individual cones of the same type appear to be unconnected, they are actually subtly linked by exclusion regions, which they use to self-organize into patterns. Multi-hyperuniformity is crucial for the avian system to evenly sample incoming light, Torquato says. He and his co-authors speculate that this behavior could provide a basis for developing materials that can self-assemble into a disordered hyperuniform state. The discovery of hyperuniformity in a biological system could mean that the state is more common than previously thought, says Remi Dreyfus, a researcher at the Pennsylvania-based Complex Assemblies of Soft Matter lab (COMPASS) co-run by the University of Pennsylvania, the French National Centre for Scientific Research, and the French chemical company Solvay. Previously, disordered hyperuniformity had only been observed in specialized physical systems such as liquid helium, simple plasmas, and densely packed granules. Evolutionarily speaking, the researchers’ results show that nature found a unique workaround to the problem of cramming all those cones into the compact avian eye, Corbo says. The ordered pattern of cells in most other animals’ eyes are thought to be the “optimal” arrangement, and anything less would result in impaired vision. Yet, birds with the arrangement studied here—including chickens—have impeccable vision, Corbo says. “These findings are significant because they suggest that the arrangement of photoreceptors in the bird, although not perfectly regular, are, in fact, as regular as they can be given the packing constraints in the epithelium,” Corbo says. The National Science Foundation, National Cancer Institute, the National Institutes of Health, the Human Frontier Science Program, the German Research Foundation, and the Simons Foundation funded the study.